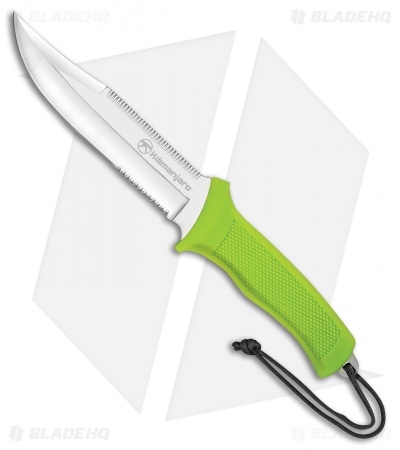 The Kilimanjaro Talbot Hunting knife is a large fixed blade knife capable of processing the largest game. Featuring a 5.75" partially serrated clip point bowie blade made of 7Cr17MoV a combination of corrosion resistance, toughness and ease of sharpening. The high visibility neon green rubber checkered handle includes an integrated thumb rasp for an excellent grip in hand. 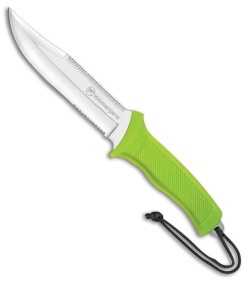 Includes a black nylon belt sheath for easy carry.